The fiery inhabitants of colonial Boston are shown in all their gritty, conflicted glory—grasping for independence as neighboring Loyalists pledge their allegiance to Mother England—in J.M. 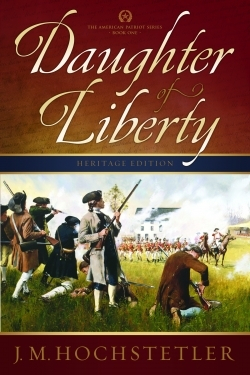 Hochstetler’s meticulously detailed Daughter of Liberty, the first book in her American Patriot Series. The year is 1775, just before the first battles of the American Revolution take place. At the heart of the story is Elizabeth Howard, who works as a young spy for the American militia, and Jonathan Carleton, a high-ranking officer in the British army. Hochstetler does an excellent job of breathing life into Elizabeth, who, as the spy “Oriole,” defies gender roles as she undertakes daring midnight forays for the rebels and works alongside her father as a doctor’s assistant. Scenes like this, however, are tempered with Hochstetler’s heavy hand for foreshadowing; too many times the reader is told that someone or something will come to take confident Elizabeth down a peg. Religious themes are woven throughout, as well, and a scene where Jonathan gives himself up to God reads like a church revival; non-religious types might find these aspects of the book a little distracting. J.M. Hochstetler is an editor and author who plans to write seven books in the American Patriot Series. Her novel One Holy Night won the Christian Small Publishers’ Book of the Year award in 2009. Daughter of Liberty will appeal to fans of historical fiction, strong female characters, smart romance novels, and series. At the end of the story, the reader undeniably will want to tuck into the next American Patriot book to learn more about how Elizabeth and Jonathan are helping to craft the future of a fledgling America.